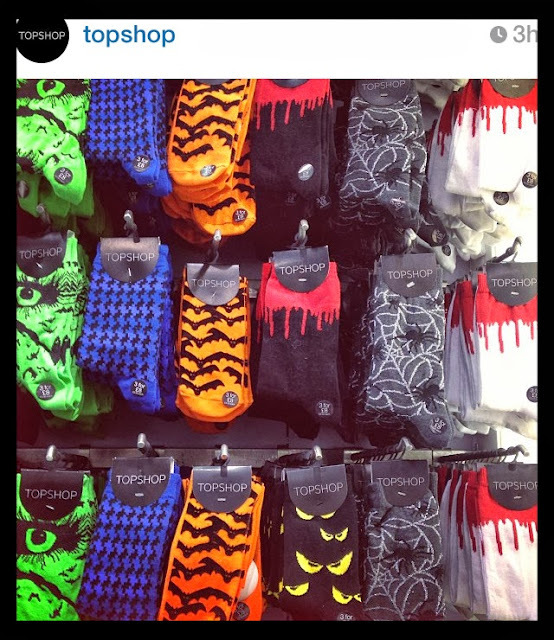 I saw this pic on Topshops's Instagram and knew that I had to do some Halloween nails based on their colourful socks. I don't know about you but I blinkin' well love Halloween. It's just so fun. I wish I lived in the US as they seem to go OTT for a bit of spooky dressing up and trick or treating. Alas! I do not live in the US and so will probably spend my night dressed as a cat drinking a little too much wine and showing everyone my fun nail art. Actually sounds quite good! I think these work well as a group or as accents. 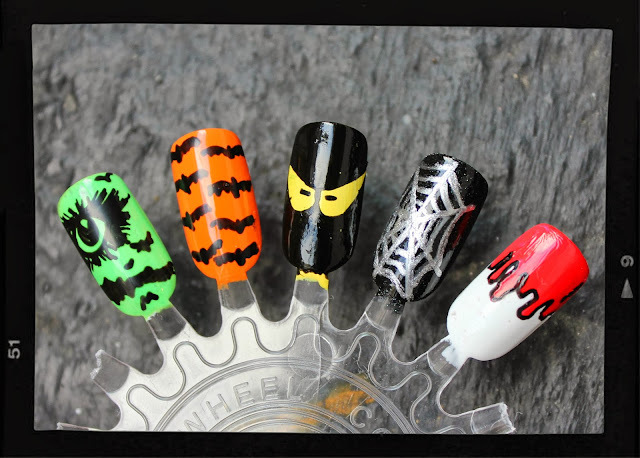 I don't think I would wear any on every nail apart from the drippy one. Maybe. I wish I could do the blue one effectively as I think the blue adds something but I wasn't all that keen on the houndstooth-esque pattern. Next time I would substitute the spider web for a blue design. Maybe just a black spider web on a blue background? Hmmm. I created these lovelies using my trusty Barry Ms. I do have other polishes I swear! It's just that I have soooo many Barrys that all of the colours I need for a lot of nail art projects are covered. Following my love of the polish, I ordered a new Barry M nail pen a couple of weeks ago and am so pleased with it. I have a silver version which I wasn't as impressed with but the black one is amazing! It draws like a marker pen; there is no need to press down on the nail so no accidental dents or unsightly splodges. Love it! Watch this space for more Halloween nail art - I've gone crazy for it! Show me your designs pleeeease!